Dimensions 0.50 by 8 by 10.75 in. Amazon.com description: Product Description: This book is designed for criminal justice instructors. It requires them to help students work through the various police reports. The reports are intentionally left incomplete to require students to work through them. Some reports may seem to ask confusing questions, which may lead to unreliable responses. This is to be used as a lesson: unreliable responses create statistics that are not valid. Managers need to improve the forms in order to obtain valid data. This book first discusses communication theory and how it applies to police officers and prosecutors in the courtroom. Information presented in the courtroom by police officers has a significant impact upon the jurors. Indeed, police officers communicate both verbally and nonverbally in the courtroom and this affects their credibility on the stand. Furthermore, by employing persuasion theories, prosecutors can align the officers' testimonies to the jurors' particular communication preference. Second, this book discusses truth as it relates to probable cause and beyond reasonable doubt. 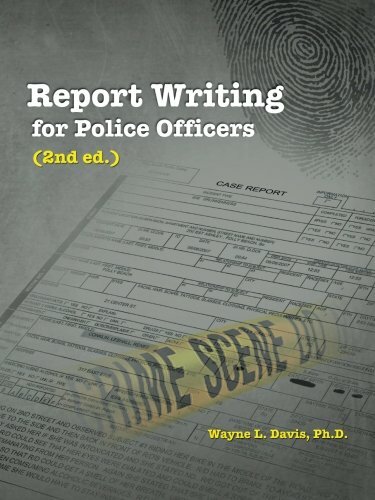 Finally, because report writing is a significant part of police work, this book presents a variety of police forms that will engage students in written communication. About: This book is designed for criminal justice instructors.